Objectives One important component of patient-centred care is provider incorporation of patient contextual factors—life circumstances relevant to their care—in managing the patient's health. The current study uses data sets collected from direct observation of care to examine if how a provider learns contextual information influences whether the provider incorporates the information into a care plan. Methods Three data sets were reanalysed: a research study with physicians, a quality improvement project with physicians and a performance measurement project with telephone health assistants. In each data set, investigators compute rates of incorporation of patient contextual factors into the care plan for encounters in which factors were elicited in response to a probe by the provider versus revealed spontaneously by the patient. 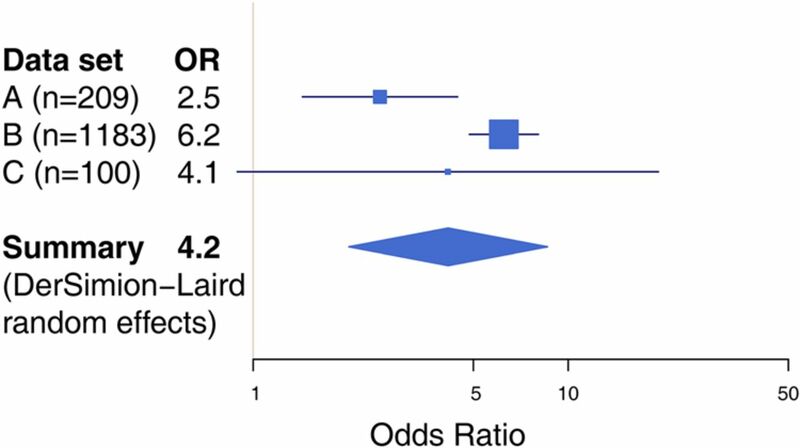 We report the rates, CIs and associated ORs for each study and overall using a random effects meta-analysis. Results Providers elicited 57%, 49% and 30% of patient contextual factors identified in encounters in each data set. Patient contextual factors identified in response to probes were incorporated into the plan of care more frequently than those revealed spontaneously by patients (68% vs 46%, 71% vs 54% and 93% vs 77%, respectively). The summary OR for incorporation of patient contextual factors into the care plan when the factor was probed versus revealed spontaneously was 4.16 (95% CI 2.0 to 8.6). While this estimate was associated with significant heterogeneity (I2=76%), the ORs for the individual data sets were 2.53 (1.4 to 4.5), 6.25 (4.9 to 8.0) and 4.2 (0.9 to 19.3). Conclusions In encounters where addressing patient contextual factors may play an important role in care decisions, factors that are elicited actively by the provider are more likely to be incorporated in the care plan than factors revealed spontaneously by the patient. These differences in the care process associated with provider performance can only be demonstrated through direct observation. Although most performance improvement measures are based in either the medical record or patient experience surveys, the direct observation of care provides critical information about performance that cannot be obtained through these methods.1–4 In particular, although the medical record may record complaints, diagnoses and care plans, it does not usually provide insight into whether and how the provider's care behaviours are more likely to yield high-value, patient-centred care. For example, performance improvement strategies may include provider incentives for recognising and managing serious conditions, but measurement approaches for these outcomes may not identify whether it is the action of the provider himself/herself that leads to greater recognition and improved management. The current study re-examines these data and two additional data sets resulting from performance improvement projects in different provider populations to consider the impact of how the provider learned the contextual information: by probing (a provider behaviour that can be targeted for performance improvement) versus through spontaneous expression by the patient. Probing is the term that is used to mean actively eliciting information from patients about patient contextual factors that may be relevant to their care.5 If information obtained by probing is more likely to be incorporated into care plans than the same information spontaneously revealed, it suggests that the physician's elicitation of context has value beyond simply revealing the information, and that performance improvement methods may need to consider information recorded about a patient and the process by which that information is obtained. On the other hand, it is possible that information spontaneously revealed by the patient will be given greater weight based on professional principles such as attending to patients’ own words when describing their symptoms and concerns. Data set A was composed of the 209 encounters from the earlier study by Weiner et al3 in which coders determined that a patient contextual factor was present in the patient's life that was relevant to his/her care. These encounters were identified using the ‘4C’ coding system, in which coders listen to audio recordings to identify contextual cues (‘contextual red flags’), and then determine whether the patient later identifies an underlying patient contextual factor associated with the cue either as a result of a physician probe of the cue or spontaneously (without a physician probe).5 Coders further review the audio recording and the postvisit medical record to determine whether the patient contextual factor was considered and addressed in the care plan. Two independent coders coded each encounter in this data set, and we have elsewhere5 reported their initial agreement on determining whether a plan of care incorporated patient contextual factors (agreement 85%, κ=0.69); disagreements were then resolved by discussion. Data set B was abstracted from 1183 patient-physician encounters with patient contextual factors present that were recorded as part of a quality improvement audit and feedback project in two Veterans Affairs hospitals seeking to increase physician probing of patient contextual factors and incorporation of patient contextual factors. The project, described more fully elsewhere,6 engaged patients in audio recording encounters with their physicians. Encounters were coded using the 4C system as in the research, and feedback from the 4C coding was provided to physician practice teams. Coders initially iteratively reviewed encounters during training until they achieved consensus on whether plan of care was incorporated; thereafter, each encounter was coded by a single coder. Institutional Review Board (IRB) exemption was obtained for receiving the de-identified data from this project for the analyses presented herein. This data set provides a large sample in the context of a quality improvement project (rather than primary research). Data set C was provided by Accolade, a company that contracts with employers or payers to provide telephone health assistants to aid employees/members with healthcare and claims needs. As part of a consulting project with Accolade, a group of the authors engaged 4C coders to analyse 96 audio recorded phone calls between clients and health assistants; 100 client contextual factors were identified in these calls. In this context, contextualisation of care planning was noted when the health assistant's recommendations considered the client contextual factors identified. As part of coder training, six calls were independently coded by pairs of two of the three total coders; Krippendorff's α for whether a recommendation considered client contextual factors in these calls was 0.69. Several months after the conclusion of the project, Accolade provided the de-identified 4C codes to the investigators for this paper. The University of Illinois at Chicago (UIC) IRB determined that analyses of these data did not constitute human subjects research. This data set provides an opportunity to ask whether the effect of probing behaviours generalises beyond physicians to paraprofessional healthcare providers. In all cases, coders were blind to the study question of whether probed or spontaneously revealed patient contextual factors might be more likely to be incorporated in care plans. In each data set, we computed rates of incorporation of patient contextual factors into the care plan for encounters in which factors were elicited in response to a probe versus revealed spontaneously. We determined exact 95% CIs around these rates, and we compared rates using χ2 tests. We also computed ORs for the effect of probed versus revealed factors on contextualisation of care and summarised the ORs using a DerSimonian-Laird random effects meta-analysis, based on our expectation of substantial heterogeneity in the projects from which the data were obtained. We used R 3.17 and the Hmisc8 and rmeta9 packages to conduct the analyses. Table 1 summarises the results in the three data sets. Among the 209 patient contextual factors identified in Data set A, 120 (57%) were elicited by a physician probe and 89 (43%) were revealed spontaneously by the patient. Factors initiated by probe were incorporated into the plan of care 68% (CI 58% to 76%) of the time; those spontaneously revealed were incorporated into the plan of care only 46% (CI 35% to 57%) of the time (χ2(1)=8.8, p=0.003). Among the 1183 patient contextual factors identified in Data set B, 583 (49%) were elicited by a physician probe and 600 (51%) were revealed spontaneously by the patient. Factors initiated by probe were incorporated into the plan of care 71% (CI 67% to 74%) of the time; those spontaneously revealed were incorporated into the plan of care only 54% (CI 50% to 58%) of the time (χ2(1)=36, p<0.001). Among the 100 patient contextual factors identified in Data set C, 30 (30%) were elicited by a health assistant probe and 70 (70%) were revealed spontaneously by the patient. Factors initiated by probe were incorporated into the plan of care 93% (CI 78% to 99%) of the time; those spontaneously revealed were incorporated into the plan of care 77% (CI 66% to 86%) of the time (χ2(1)=3.73 p=0.053). Figure 1 displays the effect of probed versus revealed factors on contextualisation of care as measured by the OR and summarised meta-analytically. The summary OR estimate was 4.16 (95% CI 2.0 to 8.6), with significant heterogeneity (I2=76%) among the data sets. Meta-analytical summary of the effect of probed versus revealed patient contextual factors on contextualisation of care. Table 2 provides illustrative examples of patient contextual factors related to medication or appointment adherence incorporated or not incorporated into care plans from Data sets A and B. In encounters where addressing patient contextual factors may play an important role in care decisions, factors that are elicited actively by the physician are more likely to be incorporated in the care plan than factors revealed spontaneously by the patient. That is to say, providers are more likely to act on relevant clinical information about patients’ lives when they elicit the information than when it is volunteered by the patient. This result also appeared to be present, with a similar effect size, in clients (potential patients) consulting health assistants, although it did not reach significance in those data, due to small sample size and high levels of contextualisation overall. There are several possible mechanisms which might explain this finding. One possibility is that providers who are more attuned to context are more likely to probe and to incorporate patient contextual factors they identify into their care plans; this would be consistent with our previous findings of a randomised controlled trial of an educational intervention to improve contextualisation performance in medical students.10 The act of probing (and receiving a positive response) itself may prime the providers to incorporate the identified context in the care plan; a similar finding has been reported in experimental studies of providers evaluating hypothetical scenarios.11 A complementary possibility is that probing signifies that the provider's attention is already on a potential patient contextual factor, and that this attention carries through to the care plan. Less ideal explanations may be that when providers already have care plans in mind, they probe cues that suggest further patient contextual information that aligns with their plan (a form of confirmation bias12). It is also possible that encounters in which patients reveal contextual factors spontaneously are in some way more complex or more difficult for providers to successfully plan patients’ care than encounters in which patients are less forthcoming. This study has several limitations. As a reanalysis of observational data, we are unable to distinguish among the mechanisms discussed above. Another limitation is that we cannot know whether a patient-revealed contextual factor would eventually have been probed by a provider had the patient not revealed the factor spontaneously, although our past work with unannounced standardised patients (who never reveal patient contextual factors spontaneously) found that physicians probed contextual cues only approximately 51% of the time,13 which is consistent with the rates of probing observed here for physicians. Finally, the presence of substantial heterogeneity among the data sets demands caution in the interpretation of the summary estimate. As incorporation of patient context into the care plan is consonant with the professional ethic of patient-centredness in healthcare, and often a necessary condition for improving patient outcomes, the present finding emphasises the importance of provider probing of patient contextual cues. Moreover, it also highlights the need for providers to be more attentive to contextual factors offered by patients without prompting. More broadly, this work has implications for performance measurement methods in general. If patient outcomes are associated with provider performance (eg, contextualisation of care), it is critical to measure that performance using approaches that are sensitive to differences, especially modifiable differences, in the care process (eg, how patient contextual factors are identified in the encounter). When such differences can only be demonstrated through direct observation methods, it is incumbent upon patients, practices and other stakeholders in performance improvement to add direct observation to their performance measurement toolkits. The authors thank Accolade for making data available to this project.
. Using standardized patients to measure quality: evidence from the literature and a prospective study. Jt Comm J Qual Patient Saf 2000;26:644–53.
. Comparing announced with unannounced standardized patients in performance assessment. Jt Comm J Qual Patient Saf 2013;39:83–8.
. Patient collected audio for performance assessment of the clinical encounter. Jt Comm J Qual Patient Saf 2015;41:273–8. Disclaimer The views expressed in this article are those of the authors and do not necessarily reflect the position or policy of the Department of Veterans Affairs or the United States government. Contributors All authors designed the study. AS conducted the statistical analyses, and drafted the paper. He is guarantor. AS, SJW, AB-C and FMW critically revised the manuscript for content, and approved the final version. Competing interests AS and SJW own a consulting company that studies contextualisation and one data set used in this project came from the work of this company. AB-C served as an independent contractor to the company in that project. SJW is on a medical advisory board at Accolade. Ethics approval University of Illinois at Chicago IRB.